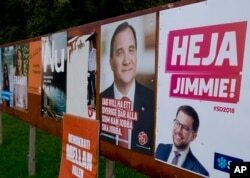 Election posters of the Sweden Democrats are put up by a party member in Stockholm, Aug. 30, 2018. The poster for the Sept. 9, 2018, election reads, "Welfare must work" and "Law and order." Swedes vote on Sunday in a tight election dominated by fears about asylum and welfare, with the populist, anti-immigration Sweden Democrats vying to become the biggest party in a country long seen as a bastion of economic stability and liberal values. Far-right parties have made spectacular gains throughout Europe in recent years following a refugee crisis sparked by civil war in Syria and conflicts in Afghanistan and parts of Africa. "Traditional parties have failed to respond to the sense of discontent that exists," Magnus Blomgren, a social scientist at Umea University. "That discontent maybe isn't directly related to unemployment or the economy, but simply a loss of faith in the political system. Sweden isn't alone in this." The Sweden Democrats, who want the country to leave the European Union and put a freeze on immigration, have about 17 percent support, up from the 13 percent they scored in the 2014 vote, opinion polls suggest. This photo shows an election poster or Jimmie Akesson, right, leader of the far-right Sweden Democrats, and Social Democratic Prime Minister Stefan Lofven, second from right. in Flen, Sweden, Aug. 30, 2018. Sweden's 7.3 million voters go to polls on Sept. 9 to elect a new parliament and government. But their support was widely underestimated before the last election and some online surveys give them as much as 25 percent support, a result that would most likely make them the biggest party, dethroning the Social Democrats for the first time in a century. That could weaken the Swedish crown in the short term, but analysts do not see any long-term effect on markets from the election as economic growth is strong, government coffers are well-stocked and there is broad agreement about the thrust of economic policy. But if the Sweden Democrats get a quarter of the vote, it would be a sensation in a country described as a "humanitarian superpower" by then-Moderate Party Prime Minister Fredrik Reinfeldt in 2014. It would also make them the biggest populist party in the Nordic region, topping the Danish People's Party, which got 21 percent support in 2015, and trump the 12.6 percent for the far-right Alternative for Germany, which swept into the Bundestag in 2017. With an eye on the European Parliament elections next year, Brussels policymakers are watching the vote in Sweden closely, concerned that a nation with impeccable democratic credentials could add to the growing chorus of euroskepticism in the EU. 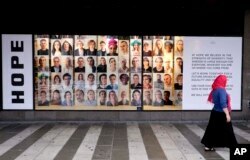 A woman walks by an advertising for diversity and tolerance in the window of shopping mall in Stockholm, Sweden, Aug. 31, 2018. Lengthening queues for critical operations, shortages of doctors and teachers, and a police service that has failed to deal with inner-city gang violence have shaken faith in the "Swedish model," built on a promise of comprehensive welfare and social inclusion. Mainstream politicians have so far rebuffed him. But with some kind of cooperation between parties in the center-left and center-right blocs the only other alternative out of the current political deadlock, analysts believe Akesson may yet end up with some influence on policy. Polling stations open at 8 a.m. (0600 GMT) and close at 8 p.m. (1800 GMT), with exit polls set be published by Sweden's two main broadcasters around that time. Results from the vote count will become clear later in the evening.